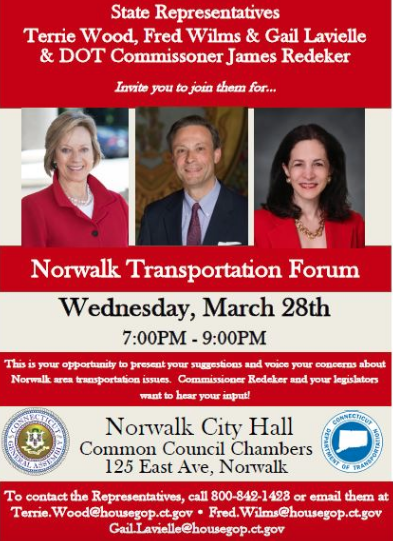 If you are a commuter or if you are interested in learning more about state transportation issues, I would like to invite you to a transportation forum in Norwalk on Wednesday, March 28 with Department of Transportation Commissioner James Redeker. I am co-hosting the forum along with my Norwalk delegation colleagues, state Reps. Fred Wilms and Gail Lavielle. We have scheduled it to give all of you an opportunity to discuss your thoughts and concerns about state and local transportation needs with ConnDOT Commissioner Redeker and local legislators. ConnDOT has proposed raising rail and bus fares 21.28 percent over the next 3 years,significantly reducing rail service on the Danbury and Waterbury Lines. Additionally,the governor has cancelled more than $4 billion in transportation projects statewide and introduced a proposal to bring tolls back to the state, raise the gas tax 7 cents over four years and implement a new tax on tires. The purpose of the forum is for us to give area residents an opportunity to present their suggestions and voice their concerns about transportation needs for the region and state. If you are unable to attend the event, please get in touch by emailing me at Terrie.Wood@cga.ct.gov or by calling 1.800.842.1423. I am always happy to discuss any concerns you have with transportation issues. 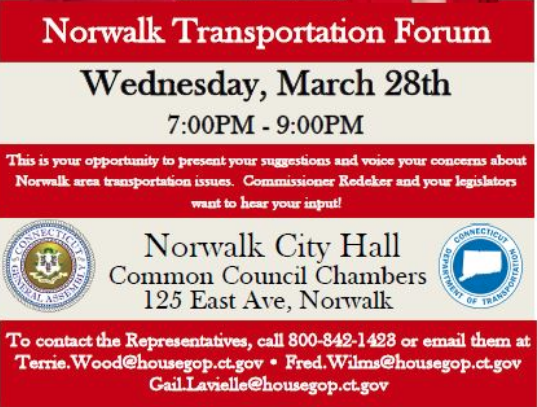 The forum will be held from 7 to 9 p.m., Wednesday, March 28 in the Common Council Chambers of Norwalk City Hall, 125 East Ave., Norwalk. 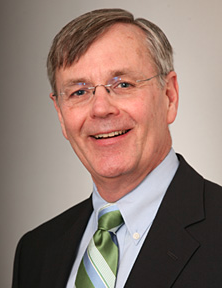 Editor’s note: Darien’s Jim Cameron, a frequent and longstanding public advocate for better transportation in Connecticut, has frequently commented on the responsibility of state legislators for fixing (and, for decades, creating) problems with transportation funding. “What are we doing here? Why are we at this hearing when nothing that you or I say tonight will do anything to change the inevitability of these fare hikes and service cuts? “This may be cathartic, but it’s just political theater. The folks you should really be talking to are not from CDOT, but your state rep and state senator. The Legislature created this funding problem and only they can fix it. State Transportation Commissioner James Redeker recently announced in a letter and news release that proposed fare increases and service reductions would “undo decades of investment in our transportation infrastructure and initiate an economic death spiral for our economy.” Here's the news release, issued Tuesday, April 24, followed by the letter: In a letter to Governor Dannel P. Malloy sent on Friday, Connecticut Department of Transportation (CTDOT) Commissioner James P. Redeker provided an update on the recently held public hearings the department hosted and made clear that without action by the General Assembly to fix long-term issues with the Special Transportation Fund, CTDOT will have “no choice” but to raise rail and bus fares and cut transit service effective July 1, 2018. Commissioner Redeker added that he “cannot support” the proposed fare increases and service reductions because they would “undo decades of investment in our transportation infrastructure and initiate an economic death spiral for our economy.” “However, I may have no choice,” Redeker wrote.